Hi everyone! My name is Natalie, and I blog over at Ivory Avenue. Ivory Avenue is a wild collection of beauty, fashion and lifestyle – though this is a rough definition. I really blog about whatever tickles my fancy. I love discussing current trends, reviewing products and finding new designers and shops. 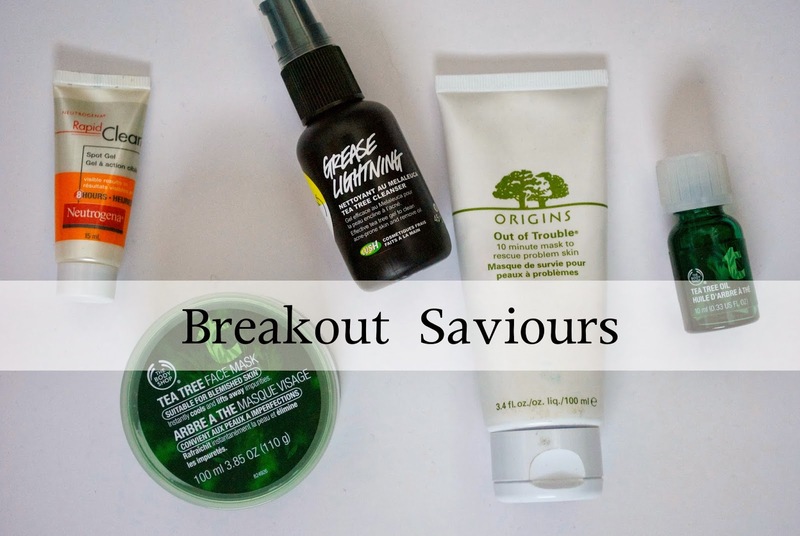 I'll be taking over Laura's blog for the day as part of the Canadian Beauty Bloggers monthly guest posting, and today I'll be talking about my breakout saviours. I'll start by telling you a little bit about my skin. Throughout high school, I had very clear skin. Every once in awhile I'd have a spot, but it was pretty rare. After graduating, I started washing my face more, and trying all the new things coming out on the market, like toners and scrubs. This caused my skin to go into panic mode - and I've been struggling with spots ever since. At any given time, I have 3+ pimples, ranging from little ones, to deep ones that hurt like nobody's business. Today I'll be sharing with you the products that I've found help deal with spots and breakouts. I am in no way qualified to recommend skincare products, these are merely my opinions on some skincare items. Neutrogena Rapid Clear Acne Eliminating Spot Gel, $7.99 // This makes spots come to a head more quickly, so in that sense, it does rapidly clear acne. I didn't feel comfortable using this product all over my face since it can be a little intense, so I used it as a topical treatment only. This leaves a crusty/flaky residue where it's been applied, so I use this as an overnight treatment only. It's not my favourite product, but it doesn't have a very strong smell which is quite nice. Though the smell isn't intense, it can be quite an intense treatment. The Body Shop Tea Tree Face Mask, $15.00 // I find this is a more wallet-friendly version of the Origins mask. It's intensive, and smells strongly of tea tree. It's green, which is pretty hilarious to apply! This mask is cooling, and relaxing. After taking it off, you really feel as though your skin has had a deep cleaning, but your skin doesn't look or feel dry or uncomfortable. For those with oily skin, I would highly recommend this. I know it seems a little redundant to use oil for oily skin, but it works wonder at controlling my slightly oily t-zone. Lush Grease Lightning, $13.95 // This is great for a less intensive spot treatment. It's chock full of great ingredients like thyme, tea tree oil, aloe vera, witch hazel, lavender and even fresh grapes! The addition of carrageenan moss (it's a type of seaweed - don't worry, I didn't know either) which creates a soothing gel base - which explains how it's so much less intensive. I use this as an overnight treatment since it leaves a bit of a crusty/flaky area around where it has been applied. It's very gentle, and I would try this is you have sensitive skin. Origins Out of Trouble Mask, $28.00 // I adore this face mask. It's intended more for oily skin types. This leaves my skin feeling a lot smoother, and generally cleaner. I wouldn't call it a miracle product, but it definitely helps make spots smaller and less inflamed. I find it works especially well at helping those subsurface (really painful!) bumps. The smell is a little strange, but the good news is, that it's unbearable, and you only keep the mask on for 10 minutes! My skin feels tight after using it, but in a fresh faced kind of way. My face feels moisturized, but not oily or dry. The Body Shop Tea Tree Oil, $10.00 // This is by far my favourite treatment for spots. I use it after cleaning my face in the morning and evening, and sometimes I'll reapply before bed. For me, this is the ideal skincare product. It doesn't dry out my skin, and doesn't feel like an intensive treatment (even though it really is). It absorbs surprisingly well, and actually helps moisturize while treating spots. The smell can be a little overwhelming (especially if you share a bed with someone!) but the smell doesn't tend to last. I haven't used this as an all-over face treatment, and tend to only apply it where I'm breaking out - which tends to be on my chin and forehead. I find tea tree oil allows the pimples to clear up, without causing them to actually come to a head. They kind of just take care of themselves, which is awesome! And there we have it - my breakout saviours. What are yours? Thanks for all of your amazing tips and tricks Natalie!! If you want to see my guest post, head on over to My Beauty Full Adventure. I tried the Tea Tree mask, I thought it was meh, I really wish it dried into actual clay texture. Oh really? I actually like that it doesn't dry as that can sometime's feel too tight! I know, me too! After Natalie's suggestions I might just have to pick it up! I can vouch for the tea tree oil! It's a great, natural way to get rid of breakouts, although I find it takes a while to be effective. Haha I actually kinda like the smell. I love this, such a great tip about the Lush product. I'll defiantly check it out. I didn't realize before, but we have the same type of skin, stupid acne. I really like the elf Zit Zapper. It doesn't smell very pleasant, but it's a great spot treatment. I'm in the market for a treatment like this. My skin has been going a bit nuts lately, and my chin has some pimples that are driving me crazy! great guest post! I have occasional breakouts, more often in the warmer months so this is very helpful. Want to try the Origins mask. I'm wanting to try out that mask too! I have tea tree oil here, I'll definitely try that next time I have breakouts! thes are such good picks!! I use tea tree oil for EVERYTHING. The obvious, spot treatment, but I also mix it with baby shampoo to wash my brushes, and when I have a severe cold, I dab it inside my nostrils to heal skin and clear sinuses. It is magic! What a great round-up! I don't suffer from many breakouts, but it's always good to know of a few goodies to keep stocked away in case of emergency. That Origins mask looks particularly appealing! Might have to try some of these for the summer months when my skin can get on the oily side!